The VUV absorption spectrometer is operating over the spectral range from 110 to 200 nm. It consists of a hydrogen lamp operating in a longitudinal stabilized discharge mode, a stainless steel vacuum chamber and a VUV monochromator (Acton VM502) equipped with a solar-blind photomultiplier (EM1 9412). It is also equipped with liquid nitrogen and a closed cycle helium cryogenic facility (CTI-Cryogenic) for measurements at low temperatures (8-475 K). The high signal-to-noise ratio allows high-accuracy absorption coefficients measurements in thin polymeric films and optical materials. This set up can be operated as an X-UV reflectometer at the wavelength limit of 30 nm after differential pumping, which is well below the edge of the LIF window (110 nm). The device is a working station and consists of a molecular beam apparatus, a quadrupole mass spectrometer (Balzers QMG 311), (which can be operated on a "time of flight" mode if required), a molecular fluorine laser at 157 nm, and a data acquisition system. 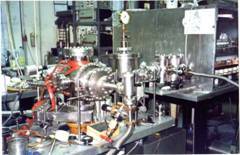 The Balzers QMG 311 quadrupole mass spectrometer is a high resolution apparatus, able to cover the 0-300 a.m.u. range. The system consists of the control unit, the analyzer and the detection electronics. The analyzer is equipped with an electron impact ionization source in an open design and the detector is an off axis Secondary Electron Multiplier (SEM) differentially pumped. The signal is amplified with the system preamplifier (EP 511) and electrometer controller (QME 311) and processed with a PC computer acquisition system and software. The mass spectroscopy facility is extended with the ion polarity unit QMS 420 allowing positive and negative ions detection.